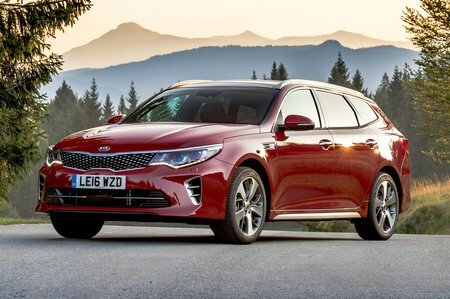 Kia Optima Sportswagon Boot Space, Size, Seats | What Car? There’ll be no complaints from those in the front, thanks to the generous head and leg room. The rear seats aren’t quite as humongous as they are in a Skoda Superb, but they're still relatively impressive for the class, seating two tall adults with knee and head room to spare, even when behind another couple of similar-size people in the front. As with most cars in this class, though, three large adults sitting side-by-side will feel a little cosy. A family estate is pointless without a boot size that can cope with everyday life, and in this respect, the Sportswagon holds its own in the class. It can't match the class-leading Superb's massive load bay, but it's bigger than the Mondeo's and provides good access, a low boot floor and no annoying lip at the boot entrance. A powered tailgate is standard on GT-Line S models. Furthermore, the Sportswagon's rear seats split in a handy 40/20/40 configuration and fold down – using levers just inside the boot entrance – to leave a flat floor from boot entrance to the front seatbacks.